YOU know when you read something and wonder if the person is actually being serious? Like something so ridiculous that it surely must be a hairy middle-aged man scratching his crotch behind a keyboard peppered with dust and crumbs, right? A 'person' (let's assume it is a real person) has posted on parenting forum, Mumsnet, asking the age-old question, "Am I being unreasonable?" The woman explained that her sister and brother-in-law are 'unusual people', so she had high expectations of a really different name when it came to their little jellybean. "The first name she came up with was Joseph," she wrote. "It's a nice name, but I said I thought she might of [sic] gone for something a bit less mainstream." So after the 'aunty' admitted to defecating all over their first name choice, the couple went ahead and named their baby something else. They gave him a name that wasn't completely mainstream, but not so ridiculous you remember it from an episode of Jerry Springer. One would even call the name 'cute' or 'pleasant'. I know, right? Were you expecting something a little ... less ... nice? So, still assuming this person is not a kid playing some pointless joke behind a keyboard, the majority of responses began to put this 'aunty' in her place. "Minding your own business is the way to go," said one of the milder responses. "Of course she didn't need to consult you," another pointed out. And the responding forum users started to become more and more fired up. "Are you serious?" asked one. 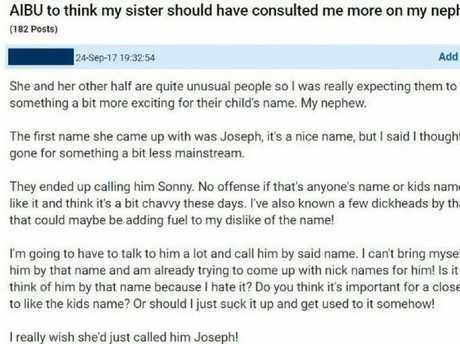 "I don't like the name sonny either (or Joseph for that matter) but why on earth would they consult you over their child's name?" "Christ almighty. No one needs to be consulted about a baby's name, except their f**king parents. Get over yourself," wrote another. "Are you having a laugh? What your sister calls her child has f**k all to do with you. Happy to help," said another. And the incredulous responses just kept coming. "Aunties name reviewing rights is one I've never heard of!" "I'm not surprised they didn't tell you after you criticised their first choice, not that it's up to you anyway!" "Consulted you. Really? Are you the baby name police?" asked another. And many, like us, were doubting the authenticity of such a question. Some even suggested that this was a 'reverse', which is where someone posts the question from the alternative point of view. Imagine this was the aunty writing the post, trying to gauge whether or not she has any right to be upset that her sister expects naming right to her own child. Oooh that would be even more bizarre and twisted then, right?